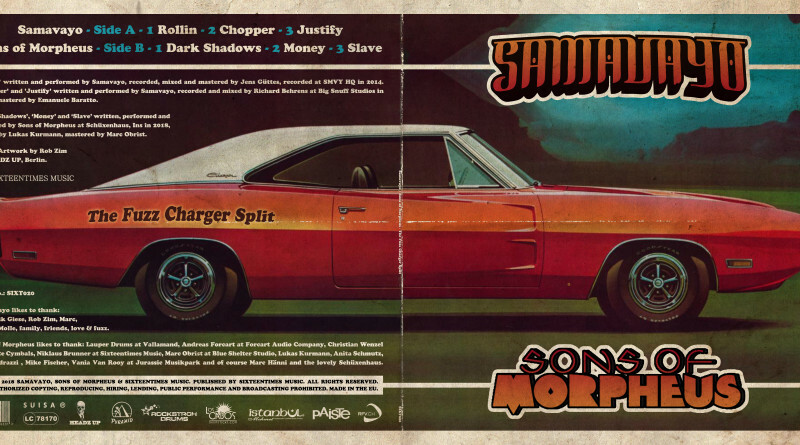 Sons of Morpheus, a wonderfully powerful Swiss psych band out of Basel join forces on this brilliant split LP The Fuzz Charger with Samavayo, a desert stoner rock band out of Berlin. Two different styles of sound, nevertheless extremely coherent in the synergy of it’s split marriage. Each song is a throwback, and could have easily been recorded out of the late ‘60s and early ‘70s. However, each song is fused into a modern showcase of today and representing the knowledge of now. Lush orchestrations, Samavayo opens the record up on Side A with three masterful tracks. The first song “Rollin” adventurously exemplifies a Hendrexian motorized distortion feedback melody that rules! Bahrang Alavi is a magician that trips out his guitar, blows minds with his pedals, and crushes the hell out of time. Andreas Voland dishes out vintage basslines of fuzzy groove, while Stephan Voland displays a loose, yet sharp and spacey backbeat breath on the kit. “Chopper” floats frequencies similar to their first track, but a bit more hard-rock oriented. Bending and weaving through tonal color distortion and feedback celebrating a spirit of the age when the fro, bellbottoms, and electric blues progressions intermingled on urban streets and music halls. “Justify” is steeped in crushing psychedelic fuzz, and guitar screams; while wonderfully woven together by comforting pure melody rhythm. This intoxicated format cranks out a funky harmonic ageless classic. Samavayo has sold their sound, and now I’ll be desperately waiting for their next release! Closing the split, Sons of Morpheus begin Side B with “Dark Shadows,” a doom-y heaviness, transitioning directly into a trance initiation named “Money”. An almost supernatural entrance of their desert sound moves into a climactic visceral voyage, then segues us gently into reverie that is the closing “Slave”. A guitar that swims us down river, dancing through freeing drum rolls and beats, accompanied by a blues bassline. The musicianship of this band’s core reflects well throughout these two songs. When all is silent, and the music’s over, flip the album over and play it again from the beginning. The Fuzz Charger Split is out on May 18th via Sixteentimes Music; pre-order it here.